March | 2016 | Richard M. Hicks Consulting, Inc. When preparing a DirectAccess server, an SSL certificate is required for the IP-HTTPS IPv6 transition technology. 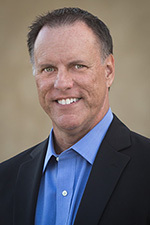 This certificate is often issued by a public Certification Authority (CA), but it can also be issued an organization’s internal Public Key Infrastructure (PKI). Commonly an SSL certificate is issued for a single hostname, or subject. As long as the hostname matches the subject, everything works fine. To ease the management burden of using multiple certificates, or reduce the expense associated with using a wildcard certificate, organizations can request a multi-SAN (Subject Alternative Name) certificate, which matches more than one subject. The additional subjects are included in the Subject Alternative Name field on the SSL certificate. A single multi-SAN certificate can be installed on multiple hosts and will work without issue as long as the hostname matches one of the SAN entries. 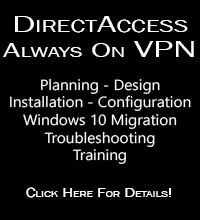 When implementing DirectAccess in a multisite configuration, each entry point in the organization will have a unique public hostname. Instinctively, using a multi-SAN SSL certificate in this scenario would seem ideal. Unfortunately, support for multi-SAN SSL certificates with DirectAccess is limited. To use a multi-SAN certificate for DirectAccess IP-HTTPS, the public hostname must match the name listed in the Subject field. In the example above, the subject is da.richardhicks.net, with SAN entries for da-west.richardhicks.net and da-east.richardhicks.net. 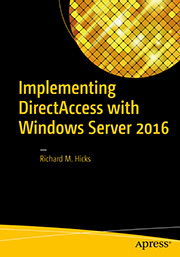 In this scenario, only the public name da.richardhicks.net is supported for use with DirectAccess. It will not work for any of the SAN entries. For example, attempting to configure DirectAccess to use this certificate with the public hostname da-west.richardhicks.net will fail with the following error message. The subject name of certificate CN=[certificate subject name] is invalid. Select a certificate with a valid subject name. Attempting to work around this issue by using the Set-DAServer PowerShell cmdlet also fails to recognize the SSL certificate correctly. Using a multi-SAN SSL certificate for the DirectAccess IP-HTTPS IPv6 transition technology is only supported when the public hostname matches the subject name of the certificate. Configuring DirectAccess with a public hostname listed in the SAN list is not supported. 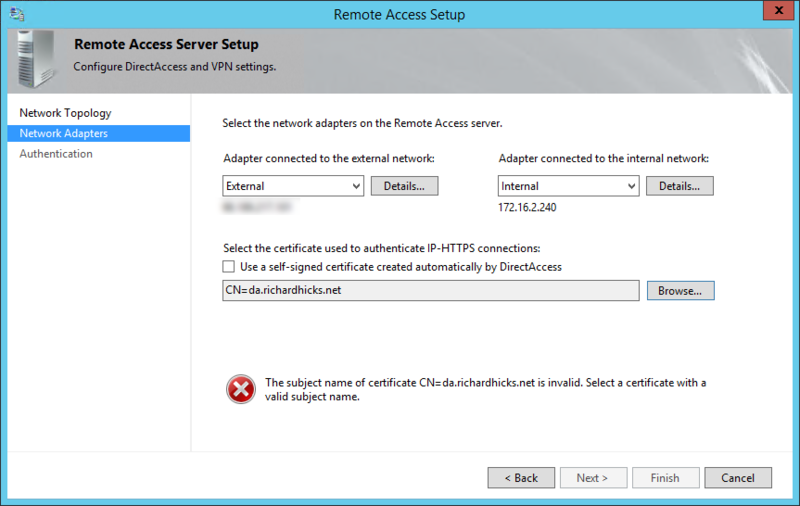 For multisite DirectAccess deployments, individual certificates must be issued for each entry point. Alternatively, a wildcard certificate can be used.